Born under the Cancer sign, I’ve always been drawn to water. 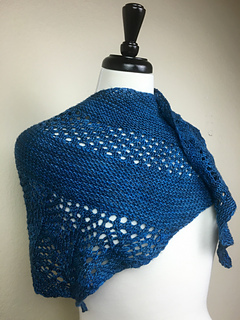 This simple-to-make but visually stunning shawlette takes a gentle boomerang shape for easy draping around the shoulders, incorporates both beginner and intermediate lacework, and is easily adjustable to use every last yard of that special skein of yarn. 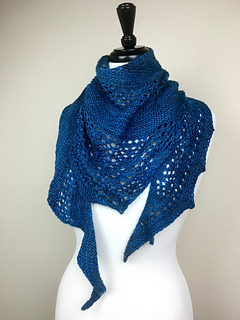 I used one skein of Pashmina, a luxurious blend of merino wool, silk, and cashmere from Madelinetosh, and a larger-than-recommended needle to create plenty of drape and use every last yard of the yarn. 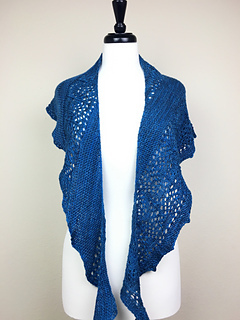 The blue colorway is a Limited Edition colorway called “Cancer”, released in June 2016 as part of the Toshstrology Collection at Jimmy Beans Wool. 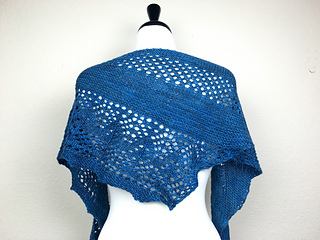 The interspersed lace patterns are meant to mimic bubbles and subtle waves, and the silk sheen of the yarn makes the fabric reflect light like rays on dancing water. 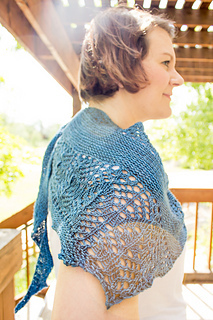 Written and charted lace instructions are included in the pattern, as well as suggestions for making the pattern fit your choice of yarn (any weight will work, really) and yardage.